Hollywood actor Ben Affleck has attacked US President George Bush's "dangerous right-wing" policies, which he said were eroding civil liberties. 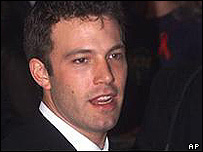 Speaking in Los Angeles, Affleck, 31, was accepting an award from political group, People For The American Way. He received the Spirit of Liberty award for his work on behalf of children's rights and voter registration. Affleck also compared the current state of US politics to the last days of the Roman Empire. Referring to fellow film star Arnold Schwarzenegger's recent election as Governor of California, he compared "the dawn of the Schwarzenegger era in American politics" to the empire's decline. Other stars attending the People For The American Way event included Harrison Ford, Bruce Willis and the Dixie Chicks. It was Affleck's first formal appearance with fiancée Jennifer Lopez since their wedding was postponed a month ago. He said he wanted to put the frenzied media interest in his private life to good use. "I accept the award in the hope that the absurd amount of publicity I received lately... might be directed at something more significant."